An interesting decorative shower curtain which brings to mind the Psycho movies. Makes for a great Halloween decoration, or even works all year. Make guests re-think about staying at your place for more than a day or two. Really want to freak out friends or guests? 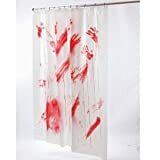 This Bloody Shower Curtain hearkens back to some classic horror movies, and is sure to leave quite the impression!